The 3rd Annual North American Handmade Bicycle Show (NAHBS), the world's largest consumer show for custom-built bicycles, offers a number of lucrative sponsorship opportunities for its 2007 show, to be held March 2-4, 2007, at the San Jose Convention Center in San Jose, California. Set in the cycling mecca of California, NAHBS attracts attendees from all over the world to see the most beautiful bicycles money can buy. Reflecting the framebuilders' very personal approaches with each product and each customer, the show is really an intimate affair, encouraging personal conversations between builders and customers, rather than a showy tradeshow with enormous booths and neon graphics. Show sponsorship is the perfect opportunity to reach this very targeted audience, including serious cyclists looking for high-end bicycles, cycling enthusiasts ready to upgrade their equipment, bicycle messengers searching for a bike to love, and engineers and art-lovers keeping in touch with the latest and greatest in handmade craft. NAHBS invites bike stores of all sizes, manufacturers, cycling services, framebuilders  any business seeking an avenue of communication with over 10,000 consumers at an incredible value  to sponsor this special event celebrating the finest in bicycle design, materials and manufacturing. Exposure in the 2008 show guide, calendar and other merchandising items provide ongoing publicity. Most sponsorship packages include pre- and post-show media coverage; online exposure, an ad in the Show program, a complimentary 10x10 booth, a negotiable number of complimentary tickets to the show, at a CPM of under $1000. Please contact Don Walker for more information about the many opportunities for brand exposure and perks: DonWalkerCycles@aol.com or 254-235-2530. The North American Handmade Bicycle Show is dedicated to showcasing the talents of individuals around the world whose art form is the bicycle. 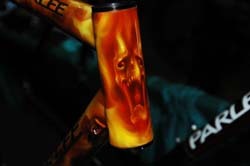 It aims to be a gathering point  online and in person  for framebuilders and consumers looking for custom-made bikes, for the sharing of ideas and promotion of this special industry which has such a rich history. After two years of growing by leaps and bounds, NAHBS 2007 will feature still more exhibitors, consumers and a wealth of seminars. For more information, see www.handmadebicycleshow.com.